at VRFA GAllery 418 Ocean Ave, Laguna Beach California. The current Realism Without Borders Spring Collection 2019 will exhibit over 50 works by 25 top International artists from Iceland to France, Norway to America, Russia to the Ukraine and featuring many new works by our French artist member Nicolas Martin. This exciting fine art exhibition blurs physical country borders and boundaries as well as allows for creative freedom without boundaries within the works. Often combining Realism, Impressionism and abstraction, the works form a bold exhibition concept that is the talk of the art world. Works range from classical realism to a new contemporary realism that may for example combine a finely rendered figure with blurred edges or abstract backgrounds. From bold brushwork to finely fit details, from the Russian schools of realism in St. Petersberg to the Ukranian works with vibrant loose Impressionist brushwork. This Spring VRFA is proud to offer a significant historical large 35” x30” William Wendt Early California Impressionist painting form a private collection. Nicolas Martin, Derek Penix, Jesse Powell, Loeoniya Okun, Craig Pursley, Rodolfo Rivadelamar, Ray Roberts, Vanessa Rothe, Valery Schmatko, Vadim Suvorov, Joseph Todorovitch, Aaron Westerberg, Jim Wodark, and Daniil Volkov. Historical Artists Include: Oleg Lomakin, Eric Borodin, Boris Gladchenko, Boris Gratchev, William Wendt, Yuri Podlaski, Erik Rebane and Vladimir Telegin. DEREK PENIX - EXCLUSIVE WORKSHOP. VRFA Gallery is proud to announce an exciting workshop by revered artist Derek Penix. This will be a 3 day Workshop is limited to 10 students and will be held at Rothe's Laguna Beach contemporary home overlooking the sea. Email or phone us to inquire or sign up, this rare workshop will no doubt fill fast. Penix will cover topics like how to make your paintings feel more 3-dimensional, the power of warms and cools, color theory, harmony, edges, shape-quality, variety, simplifying, loosening brushwork, elements of design, elements of light and shadow, the power of suggestion and finally painting how you see versus just copying a photograph. Students will use oils (acrylics are allowed as well) to paint from photos. They will have a choice of dozens of photographs consisting of trees, boats, cityscapes, figures, koi, hanging fruit. Students will also have the option to paint from their own photos if they choose. This class is almost full. Opening Day and Eve December 1st from 10am -7pm. Featuring over 50 new works by Russian, American, Ukrainian and French artists. Also see our special sale page of $500 or less from this collection - shop online with the link above. “Fashion has longtime been an influence on artists and their paintings, as have historical master works in turn influenced many fashion designers throughout the ages. From the gold embroidered folds on the dresses found in Waterhouse’s paintings, to the top hats the Dandy's wear in the Impressionist works by Caillebotte, couture in paintings not only shows us what the styles were in at the time, but reminds us that clothing itself can often be a "work of art" and a form of expression. Combining top contemporary realist paintings from around the globe with one of a kind creations by current fashion designers and a bespoke shoe maker, this exciting new exhibition aims to celebrate the long time inspiring relationship of fine art and fashion.” Explains the curator Vanessa Françoise Rothe. Invited Exhibiting Artists Include: Jeremy Lipking, Joseph Todorovitch, Casey Childs, Mia Bergeron, Vincent Xeus, Michael Carson, David Gray, Stephan Bauman, Cornelia Hernes, Adam Vinson, Olga Krimon, Nicolas Martin, Megan Euell, Peggi Kroll-Roberts, Michelle Dunaway and Vanessa Rothe. Bespoke Shoes created by Francis Waplinger confirmed. Fashion Designers creating works for the exhibit and Designers on panel TBD. The exhibition will consist of a very fine collection of approximately twenty five one of a kind oil paintings by top contemporary realist painters who were inspired by the world of fashion. In addition, one of a kind shoes, dresses, and jackets by contemporary fashion designers will be created for the exhibition and available for sale. "Fine Art and Fashion" will take place in the famous Salmagundi Art Club patrons gallery and glamorous parlor on 5th avenue in Greenwich village where, for the last 100 years, fine artists, screen writers, authors, poets and creatives have met to exhibit and discuss their work . One of the country’s oldest and most respected art organizations is the perfect host for this current and important exhibition combining the worlds of fine art and fashion. The hollowed halls once graced by Winston Churchill, Louis Comfort Tiffany and Childe Hassam, will serve as the perfect backdrop for the works and discussions and has always played a vital role in helping the American public develop a greater understanding and appreciation of art. On Tuesday evening October 2nd join us from 6-8pm for an exciting evening educational event where fine artists combine with top fashion designers from NYC to discuss the creative process of “Creating a Collection” in the Parlor moderated by Douglas Hand, leading New York Fashion Attorney. Fifteen well known American Realists/Impressionists are currently creating a collection of new works inspired by Paris, the capitol of art, cuisine and fashion. Two sets of paintings will be created, one for Arcadia Contemporary and one set for Galerie L'Oeil du Prince. Artists Include: Jeremy Lipking, Casey Baugh, Ryan Brown, Micheal Klein, Vincent Xeus, Michelle Dunaway, Olga Krimon, Vanessa Rothe, Julio Reyes, Candice Bohannon, Casey Childs, Joshua La Rock, Katie Whipple, Brendan Johnston, Nicolas Martin, Alex Venezia and more. Many of the artists in fact traveled to Paris May 2017 thru the Paris Seminar. There we painted together, learned about group figure composition, studied the masters in person at the top Museums, traced the footsteps of great American artists who painted in Paris and gleaned how literature can play a role in inspire great paintings. This rare voyage aimed to re created some of the late 1800s where artists such as the Impressionists often painted together and created exhibitions together, influencing one another. The two Bi Continental exhibitions, one in Los Angeles California, and one in Paris France, will present their finished works as a group and may include on location studies along side to show the inspirational process. These exciting new works will include: self portraits, still life's, landscapes, figures, and city scapes. The works will all have a link to a Paris based inspiration that will be called out on the wall placard explaining the influence. Weather they were inspired by historical American Artists who spent time painting in Paris such as CHASE, SARGENT, or by a French novel they read (Flaubert, Rousseau, Baudelaire perhaps?) a museum they visited and its walls or history, French decadent Interiors, Parisian fashion, or by one particular painting they saw in person there its color harmony, application of paint, or genre. Gregory Ananiev and is proud to present two award winning artists now showing with VRFA: Mia Bergeron ( shown here), Cornelia Hernes from the Florence Academy and Matt Talbert. Join us for the new Spring Collection where Realism and Impressionism combine to create fresh new works for your fine art collection. From beautiful spring florals as still life and landscape, to refined tonalist figures, to well lit interiors and bold brush portraits. Introducing new artists to the VRFA fine art collection and Realism Without Borders group: Mia Bergeron ( Canada), Cornelia Hernes (Norway) J. Louis (German/American) and Matt Talbert (American). Lovely academic works by Cornelia Hernes, bold Russian Impressionist works by Daniil Volkov, thickly painted figures by Talbert, and a new series of works that melds fine technically skilled realism and classical style with and adds abstraction to the edges of finely painted realist figures. Realism...Without Borders. Featuring works by leading American Impressionists as well as Russian and Ukrainian Impressionism, both historical and contemporary. Mark Fehlman, Jesse Powell, John Burton, Ray Roberts, Craig Pursley, Jeff Sewell, Rodolfo Rivadelmar, Jim Wodark, Debra Joy Groesser, Vanessa Rothe, Sergey Kovalenko, Vadim Suvorov, Daniil Volkov. Join us in New York City! Special weekend events December 8th and 9th, 2017. VRFA helps the famed Salmagundi Art Club celebrate its 100 year Golden Anniversary on 5th ave in New York with a top notch International fine art exhibition: "REALISM WITHOUT BORDERS" NEW YORK CITY! This December plan your Holiday Shopping in New York !! On view December 5th - Dec 10th, 2017 in the Parlor of the famed Salmagundi Club New York at 47 Fifth avenue where icons such as Thomas Moran, Winston Churchill and Tiffany were members. This beautiful and rare exhibition will include works selected by top International artists from Sweden, America, Russia, France, Italy and Ukraine. Curated by Vanessa Rothe Fine Art and held in the beautiful iconic Parlor of the famed Salmagundi Art Club in New York. Works range from $500-$10,000 with many small gems to choose from. Public Reception on Friday December 8th from 5:00-8:00pm at the club on 5th Avenue. Fine Art Lectures and a live portrait Demo by Michelle Dunaway are scheduled for Saturday December 9th between 1:00-5:00pm at the club. Featuring fine art work by Parisian Artist Nicolas Martin our newest member of RWB and VRFA. Including New work by prestigious artists such as: C.W Mundy, Nick Alm, Aaron Westerberg, Michelle Dunaway, Olga Krimon, Jeremy Mann, Mia Bergeron, John Burton, Ray Roberts, Peggi Kroll Roberts, Vanessa Rothe, Danil Volkov, Vadim Suvorov, Gregory Ananiev, and fine work coming up for resale from the Esteemed Marano Collection by Jeremy Lipking, Vincent Xeus, Jeremy Mann, Julio Reyes, Juliette Aristides Daniel Graves and more. The Exhibit will also include fine Historical Russian Impressionist Paintings and a beautiful Edgar Payne Historical California Impressionism. With any luck we will get some twinkling light white snow with our white Christmas lights. Give the gift of travel & experience, and the gift of art ... a gift that lasts a lifetime. The exhibition will follow to Laguna Beach, California from December 15th thru January 15th with fine new works from across the globe. Exciting new works by Olga showcasing her new series of florals and figures. Eric Bowman, Mark Edward Adams, Olga Krimon, Mark Fehlman, Jim Wodark, Craig Pursley, Tom Balderas, Vanessa Rothe and a gem by Jeremy Lipking. "coloring out of the lines" here at VRFA Gallery to bringing our clients FRESH new works and exciting themes to add to their collections. We are "off to the races" with this new exhibition coinciding with the open season at the Del Mar and Santa Anita horse racetracks here in California. Taking inspiration from the Impressionist DEGAS the exhibit and works will focus on movement and brushwork. They are a strong combination of exquisitely rendered realism with a loose impressionist brushwork, the combination VRFA Gallery has become known for. The works are simply divine that are coming in, as if you stepped into a fine art Museum in Europe. This luxury event brings a long time treasured sport of horse racing to light and celebrates also horse and hound and Western horse and rider. Featuring special guest equestrian artist Sam Robinson and his newest collection created for the gallery, along with VRFA artists listed above. Also featuring NEW sculpture artist Mark Edward Adams and his fine works of horses in bronze, clay and terracotta and great new sculptures by Mardie Rees. Beautiful additions to your mantle, garden or entrance table. VIEW THE DIGITAL CATALOG ONLINE NOW! Join us Thursday night at the NEWPORT BEACH Yacht Club 1099 Bayside drive. 5:30 to 6:30 for a beautiful slide show Lecture on admired Marine artists William Ritschell and Armin Hansen. Learn about their history, marvel at their powerful works of the sea, and learn about their influence on the artists and directly the works in the exhibition. 6:30-8:30 Then follow us to the DEBRA HUSE GALLERY at Marine Ave for aperitif and to view the new works inspired by these masters. Port and Starboard is a collaboration event with Debra Huse Gallery and Vanessa Rothe Fine Art. Long time friends Debra and Vanessa join together for the 3rd time to present PORT AND STARBOARD 3. A meeting of East meets West of International Fine Art from Russian to America. Featuring new art works from from top artists such as Ray Roberts, Debra Huse, Peggi Kroll-Roberts, Vanessa Rothe, Daniil Volkov, Sergey Kovalenko, Jim Wodark, and many more.Join us for these exciting EVENTS associated with the exhibition.Show will run Thursday June 8th till Friday July 2nd, 2017. Debra Huse, Jim Wodark, and Karina Voloshko. We present a weekend of International Fine Art with French Interior Design & Decor. Featuring new art works from France, Russia and America. The finest imports combine for this special holiday. THE JETSET COLLECTION features over 50 fine art works from around the world. From Paris to the fields of Provence. From the Swiss Alps to the California Coast. From Russian snow filled villages to modern Ukrainian portraits. We will show you the influence of Japanese deign on a California artist, and dive into the turquoise seas of Croatia. From top Italian cities to the ever popular Wild West scenes of America... this exhibition will take you around the globe...thru the eyes of the artists. Vanessa Rothe Fine Art: A great place to become a collector...or a connoisseur of Fine Art. Vanessa Rothe Fine Art is proud to exhibit this 100 painting collection of fine art works at the Randy Higbee Frame Venue, in this exciting new event coming Saturday November 5th, 2016. Featuring over 100 works of art from the gallery collection by top International artists with live demos, lectures and workshops... you wont want to miss this fine event and sale. Join us NOVEMBER 5th at 5:00pm at 102 Kalmus in Costa Mesa for a look at REALISM and IMPRESSIONISM today and 100 years ago. Exhibition Includes rare works by California Impressionist artists: William Wendt, Edgar Payne, Hanson Puthuff, ( Grace of De Ru's Fine Art) as well as living artists Ray Roberts, Jeremy Lipking, Scott Burdick, Debra Joy Groesser and Peggi Kroll Roberts. 5:00-6:00pm SATURDAY November 5th - 5:00-6:00pm The event Kicks off with a lecture by curator Vanessa Rothe who will present a beautiful 40 min slideshow on French, Russian and American Impressionism, how it came to be, and the historical significance of the art and artists involved in this Exhibition and Sale. Co-Curator Akhmed Salakhly along with Rothe will answer questions during Q and A on the works as well as similarities and differences in Realism and Impressionism. 6:30 pm to 9:00pm Continued Opening Reception after the lecture, with tapa's and wine! Discussions with the artists in attendance. Vanessa Rothe Fine Art is proud to offer this Step by step free educational demo by fine artist Craig Pursley on September 7th, 2-16 in the morning here at the gallery. Join us at 418 Ocean ave, Laguna Beach CA for an exciting and educational demo. Thank you Craig for supporting the arts and sharing your vast knowledge. Featuring works by PEGGI KROLL-ROBERTS as well as new work by 20 landscape and figure artists. Oils, gouache, and watercolors, from small studies of figures on the beach to final 30x40 Museum quality paintings of Crystal Cove and Laguna. Offering works by American Russian and Ukrainian artists in three mediums. See workshop below as well. With Peggi Kroll Roberts! in Laguna Beach. VRFA has put together and is proud to host the weekend workshop by Peggi Kroll Roberts on JULY 2nd and 3rd 2016. FULL. on July 2nd. Peggi is an amazing teacher, for all levels and will show you some great fundamentals as well as bring your works to a new level. With her successful teaching methods you will learn about light and shadow, warm and cool, values, and important brushwork techniques. Class will meet at the gallery and then be working on location. Call or E mail us here on our CONTACT page, to be put on the wait list. April 8th Opening night events at Laguna College of Art and Design, Laguna Beach CA Exhibit runs April 1-15th, 2016. April 28th Opening night events Salmagundi Club New York. Exhibit runs April 28th - May 1st, 2016. Following in the footsteps of the great American painters before them, a group of young realist artists will travel to Paris in late summer 2016. They will study the masters in museums, learn from curators and educators in the field, and paint together as they study pictorial composition and humanities, with the goal of reaching the next level of mastery in their work. In April 2016, The Paris Seminar will hold two exciting exhibitions one on the West Coast at LCAD and one on the East Coast at the Salmagundi Club New York, where you can attend demos and lectures and purchase fine artwork by the artists. Help make art history by supporting the artist, each work will be for sale individually and patron donations are welcome. Lives demos at LCAD by Adrian Gottlieb and kate Sammons, at SCNY by Michelle Dunaway and Michael Klein. Composition lectures by Sean Forester, Humanities by Vanessa Rothe. Exhibits curated by Vanessa Rothe and Hosted by the famed Salmagandi Art Club, 5th ave, in NEW YORK CITY and in Laguna Beach. March 11th in Denver Colorado. Over 75 new works by 30 artists with lectures, discussions and live demos. 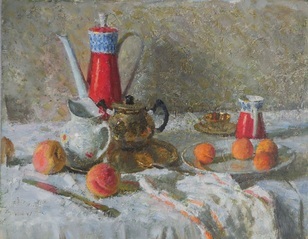 Contemporary works from Russia & Ukraine alongside works by American Impressionists and realists, along with Historical California Impressionism and Historical Russian Impressionism. This exhibition will compare and contrast painting styles, paint application as well as subjects from two continents and two centuries. Live Duo demo with contrasting styles by Olga Krimon and Vanessa Rothe Saturday March 12th 10am to 12 noon at ABEND gallery, Denver CO. Runs Dec 4th thru the 20th, 2015. New contemporary works from Russia & Ukraine alongside works by American Impressionists and realists, paired with Historical California Impressionism and Historical Russian Impressionism. This exhibition will compare and contrast painting styles, paint application as well as subjects from two continents and two centuries. 40 works with live demos by Tom Balderas and Leon Okun. 480 Ocean Ave Laguna Beach CA on Dec 4th from 5-8pm. New work from all the VRFA artists will be available with subjects that evoke Autumn as well as a fine collection of their typical subjects. Selected work from top American Landscape artists as well as Russian and Ukrainian oil paintings, studies, and plein air. July 3rd Sept 3rd, 2015. From 4:00-7:00pm. VIEW the DIGITAL CATALOG HERE LINK to LIVE Issuu Catalog. Join us at the 1920's early California studio as we show 30 new paintings with the theme of summer on the walls from July 3rd thru September 3rd, 2015. American, Russian and Ukrainian Realism and Impressionism. Fresh Watermelon, sun bathers with umbrellas, coastline scenes of Laguna, colorful french boats from the Riviera, golden hills of California, Russian wheat and hay rolls in the countryside. Join us Friday July 3rd for a opening night soiree at the studio 4:00-7:00pm with a live demo. The "SUMMER" exhibition will be held at Vanessa Rothe Fine Art Studio downtown Laguna Beach, California at 418 Ocean Ave.
April 30th thru June 30th at the Huntington Beach Art Center, Huntington Beach CA. Vanessa Rothe co Curated and Participated in for the California Museum of Fine Art booth and Exhibition included works by master artist Dali Higa and Dan McCaw, along with Danny McCaw, John McCaw, Karl Dempwolf, Vanessa Rothe and Millie Greene. Additionally there were 5-6 fine contemporary artists from Russian Repin Art Collection including Alexander Kremer, Daniil Volkov and Sergey Kovalenko in this fine and unique exhibition that enjoyed over 5,000 attendees. To see more of our other recent events please view the Curator Page.